This man is an incredible coyote skinner. I watched him skin several coyotes in the 1:25 minute range. He has been video’d several times at that speed... beater coyotes of course, there’s no faster coyote to skin than the tiny little half pint pups. I will not tell you his name, but you may call him Mister Joshua!!! Your telling folks about your ringer. Marty tisk tisk. That's not how you gamble if you have a ringer. The skinning comp at the rendezvous is gonna be exciting. That was my thoughts last summer... but I still got the second place LOSER award at the convention! I guess they count... but def all relative... was it a lill' kiyute or was it a COYOTE??? Here's a couple actions shots of "the true Mr Joshua"
A see a strong resemblance... how about you? Ya... I dunno... there is sensitive equipment in the background on the four videos I took of him. You know, the kinda stuff that helps enable guys like us to get coyotes finished in significantly less than 15 minutes. We wouldn't want Super Daves head to explode or have him end up with a lobotomy like all the guys on "Planet of the Apes". Can't have that all get out or a guy will never win a skinning contest! Just like Billy the II has pointed out! The man does have a unique opening technique. Then perfect long leg slices help his time, assertive head cuts, ascertive everything! But having that perfectly sized and thawed coyote is mandatory to be under that 2 minute mark. I had watched a very tall man open a coyote kinda like this guy, on a skinning video, but I believe he opened on a table and then hung up. There's your hint! I never did understand how he got it done, but I have it figured now! I watched him in the late season so I won't be using his technique in this years skinning contest, but I'll try to practice up this winter for next years. I doubt I'll be able to match his time, I don't bend and contort like a 23 year old no more, actually I do kinda feel permanently bent... like physically too! Dave doesn't care about fast skinning. Dave is more impressed with results like what Peter posted. Besides, the guy isn't that fast. 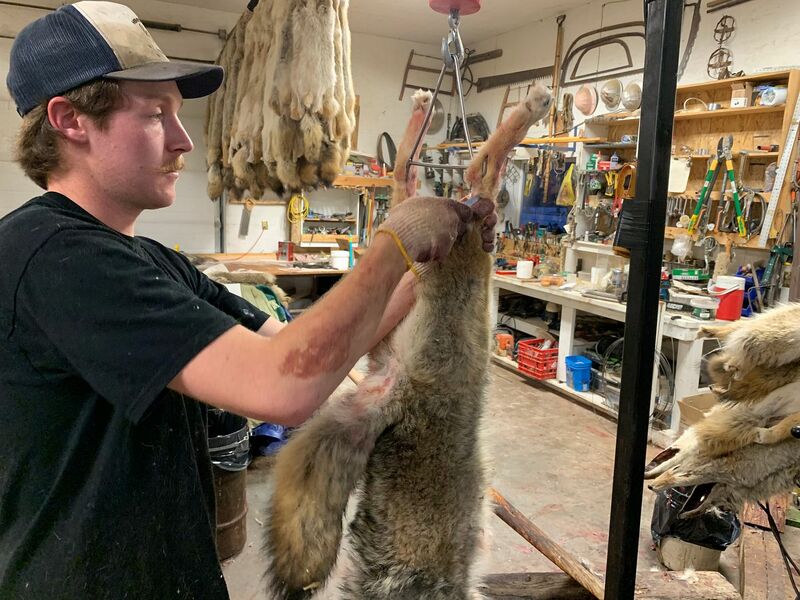 He's been skinning that coyote since April 4. Y’all can pretend all you want. I understand. I took basic psychology in high school.